In relation to our typical wedding cake order, which is made months in advance, our client who had recently moved to Hawaii from the mainland, had contacted us less than 2 months before her wedding date to make a cake with a "Wow" design for her 200 plus guests. She and her fiance loved one of Rick's cake designs, which he had originally designed for our bride Bree in 2009, and has been a well-requested design from brides since. 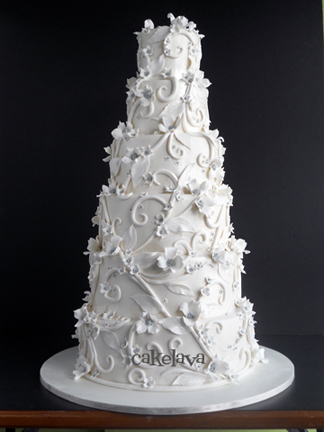 It is rare that we duplicate previous designs, but certain cakes seem to have mass appeal and this is one of them. Rick has never made this specific design as large as this and spent a good amount of time making all the handcrafted flowers covering the cake. Wanting to be sure he had enough flowers, Rick made 1000 of them and ended up using roughly 700 on the cake. Between the 6-tiers covered in fondant, the hundreds of flowers all over the cake and the inclusion of on of our most weighty and rich flavors of cake, Hot Fudge Sundae on the inside, this cake weighed a ton! We estimated that the cake weighed 100 pounds, slightly less than my weight, but it felt way heavier than me. Rick and I could barely transport the cake together and we opted to have the cake delivered by Rick and another man. Even with two grown men, this cake was an exhausting delivery! The cake was delivered to an estate on the east side of Oahu that had an extremely large front and back yard, which meant the cake had to be carried about the length of a football field to reach its destination. It was a gorgeous affair with top notch vendors and the cake looked right at home in its environment.